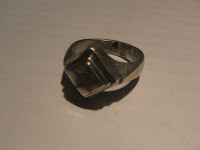 This is a legendary Haddid Al sein, it is a very old ring that has a written Talisman inside it, it is empowered and has symbols and Hematite embedded within it. The first apostle of God Ali ibn Abu Talib possesed one of these rings and was of the bravest warrior and the most subtle channel and could easity communicate with the spirit world as well as the nature spitits around him, his strength was unchallengeable often calling to the whales and Dolphins as well as the angelic realms for help in the physical battles he endured. 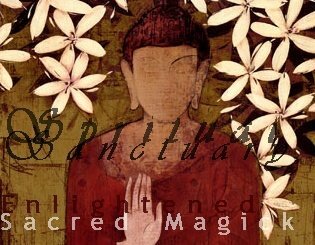 He was an enlightened warrior who was beloved for his kindness and love, these balanced characteristics that are associated with this ring of power, this ring connects you to the spirit realms keeping you empowered in the physical giving one a charismatic appeal and demanding presence! The wearer of this ring of power will never be defeated in debates and disscussions always basing arguements on rationel and justice, everything about this ring is empowered balance. The essense of the talisman and powerful words and symbols embedded is divine justice and balanced existence, a balance of dimensions the balance in this physical existence and existing in between both ultimately making the wearer an elevated self who becomes richer with the layers and multi faceted appeal the wearers personality attunes to. This Ring also offers protection in a powerful way, it is an invincibility talisman aswell that offers invisibility to a certain extent. 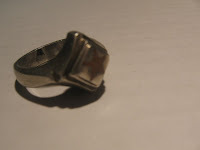 The ring itself is handcrafted with silver it is solid and heavy for its intricate casing, sealed in is a talisman enscribed on paper the 'Naqsh' and powdered hemetite, on the face is a copper pentagram that is used in powerful Islamic magick and naqsh writing for talisman and spells.